Processing expense reports is notoriously tedious. Employees both on the road and in the finance department don’t enjoy the labor-intensive workflow of recording, submitting, reviewing and reimbursing expenses. Luckily, expense management software can help automate the entire process, saving companies valuable time and energy. 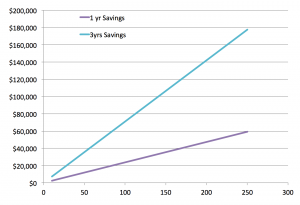 The idea of switching to a better solution is appealing, but what about cost? Going through a return on investment analysis is a good way to check the numbers and see whether expense management software make sense for your company. The average salary of staff, including any overhead. It takes a little data mining to get these internal numbers. However, if you want a quick back of the envelope analysis, you can start with the statistics we have gathered from research reports published by the Aberdeen Group. Each employee, in a small to medium organization, submits on average 1.5 reports per month. The average cost of processing a single expense report is $20.65 when no expense management software is used. And finally, the cost of processing reports drops to just $7.50 when software is used to automate the expense management process. The new cost of processing expenses includes the price of the software. If you don’t have these data, just multiply the industry’s average cost of processing a single report by the number of reports your company processes each month. To makes things more tangible, let’s walk through an example of a medium-sized company with 150 employees. The difference between the current and the new cost is almost $3000 per month, a 64% savings. This represents $35,500 in one year or $106,500 over 3 years. Finally, you need the cost of the software. Assuming $5 per user per month, the ROI in our example would be 395%. Not bad! You can also do the same calculation if you have an existing solution to see whether it’s beneficial to switch to another provider. 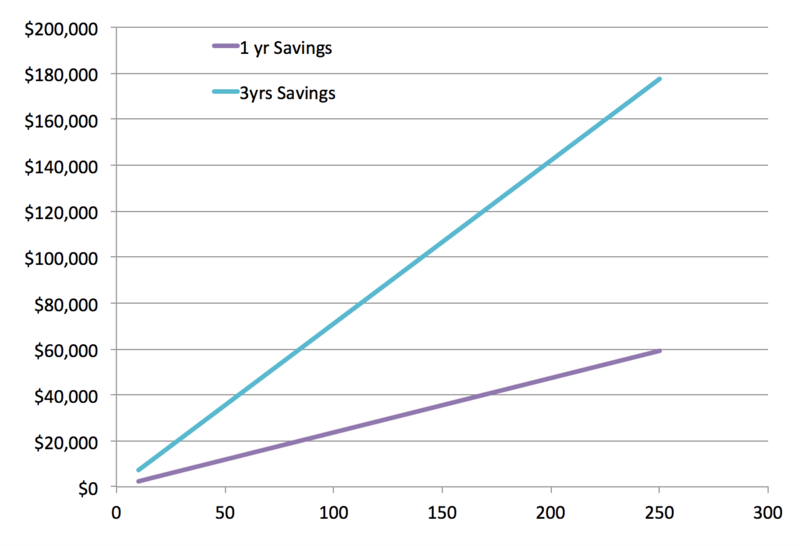 The graph below shows the saving over 1 and 3 years based on the number of employees. The ROI is the same. It is worth noting that the final ROI could be even larger, as the cost savings we have used here are only related to the gains in process efficiency and do not include the benefits from improved compliance and taxes reclaims. Last but not least, another benefit is employees’ satisfaction, which is hard to quantify but just as important.